While at the Smithsonian National Museum of Natural History, (see previous posts here and here) I did manage to tear myself away from the collections long enough to browse some of the public exhibits. 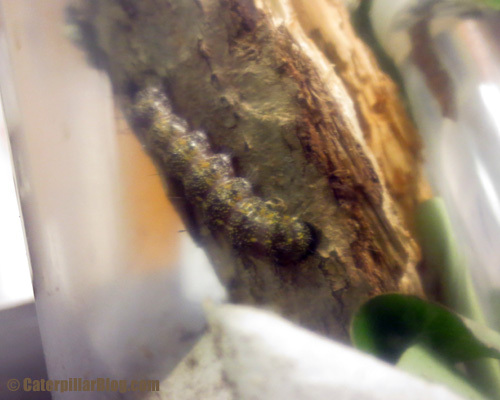 I did not go into the butterfly house (didn’t have my wallet with me, you have to pay to enter), but I did see some caterpillars! 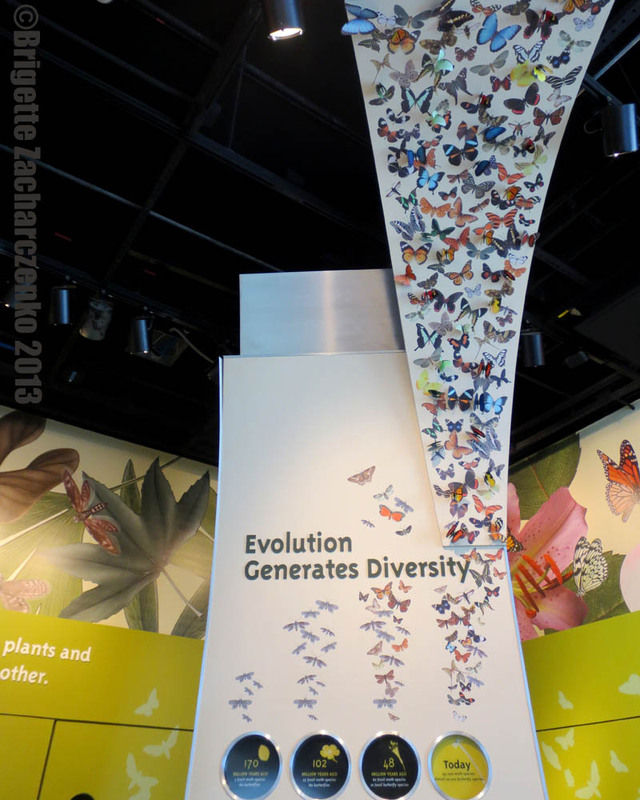 There was a whole section of the museum devoted to insects and invertebrates, with many live organisms on display. 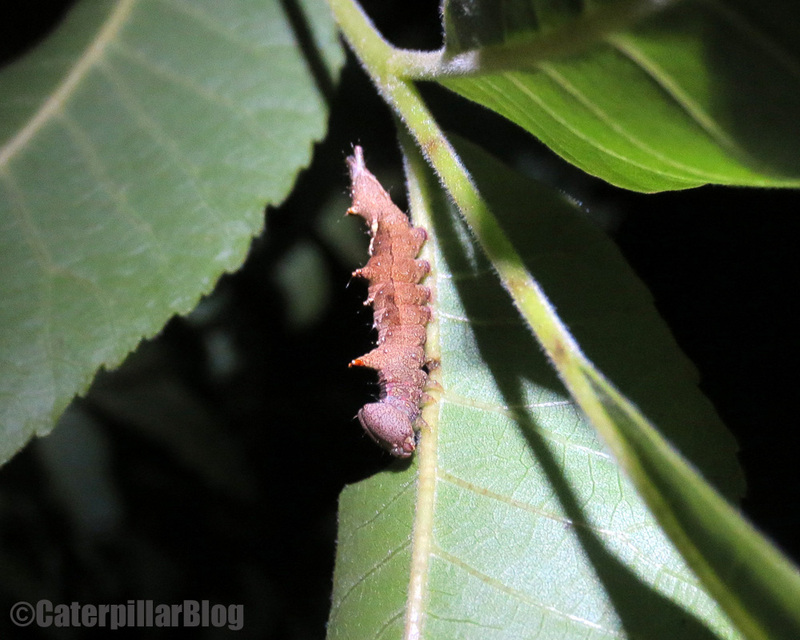 There were a lot of the usual suspects (mantids, tarantulas, roaches), but they also had some hornworms (Manduca sexta). 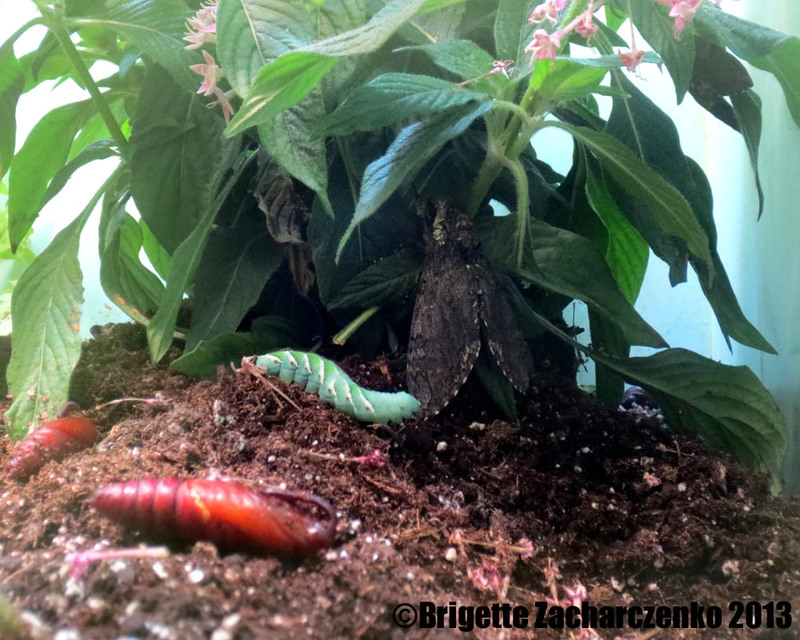 There was a display with a multitude of pupae, a few caterpillars, and one freshly emerged adult. 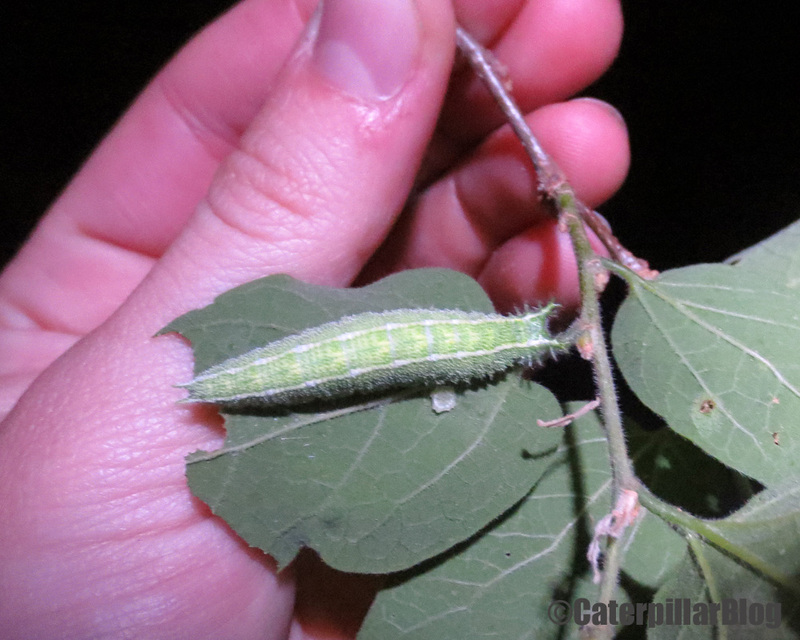 It was being nibbled by a persistent, and apparently violent, caterpillar. I do not know why. 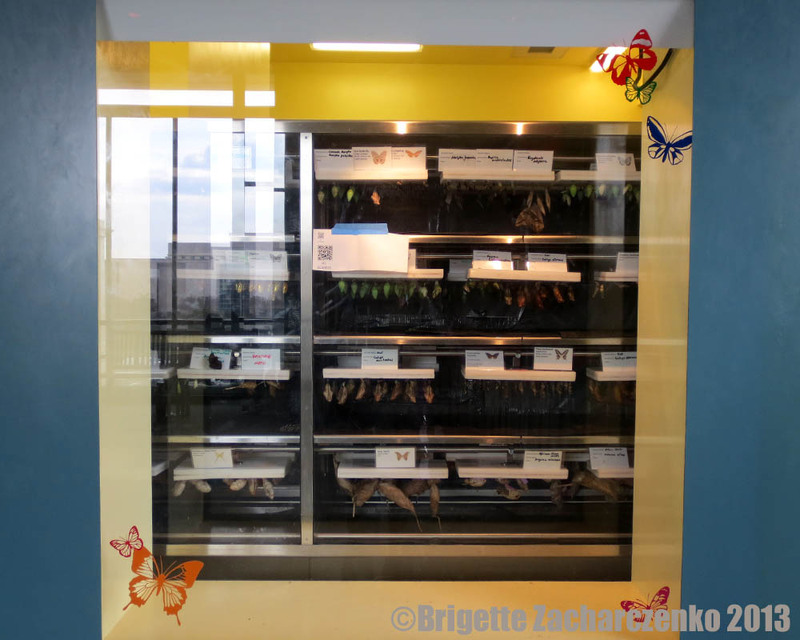 There was also a display where you could see some pupae of various species hanging – waiting for their chance to emerge and become part of the butterfly house. There were not just butterflies, though. I could see many moth cocoons, the fuzzier looking ones at the bottom. And I really liked the displays! The blatant emphasis on evolution in almost every single display and description is refreshing (the hall of human origins is wonderful). Whenever I start to despair and worry that there is not hope for humanity to accept science, I should go visit a natural history museum. They don’t hold back. 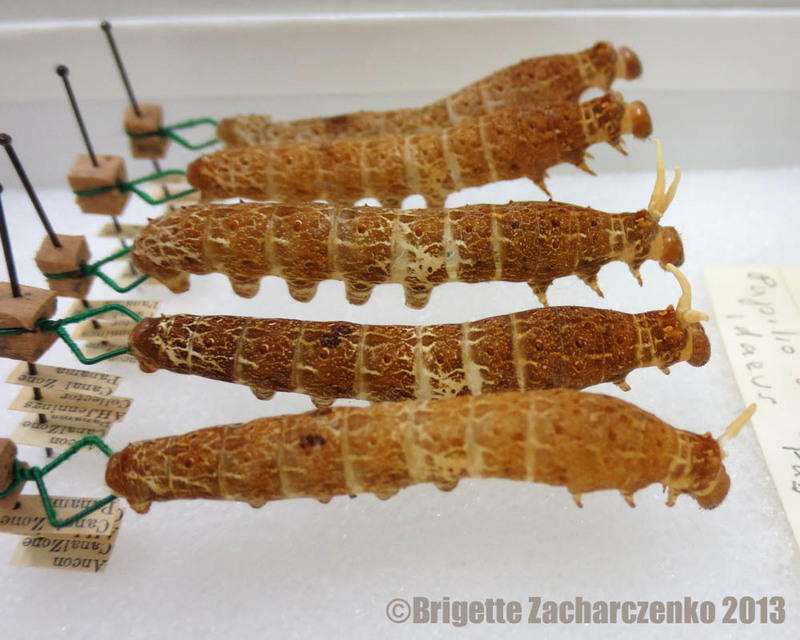 Here are some more inflated caterpillars from the Smithsonian NMNH (click here to see some from Cornell’s CUIC). I have determined that a friend of mine, who works in another lab, has access to materials I could use for inflating caterpillars. 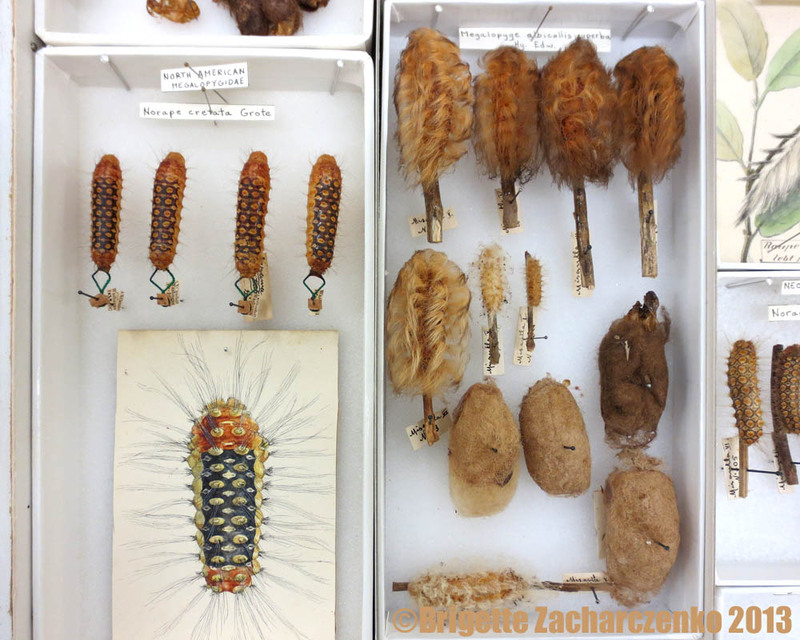 I can’t wait until the collecting season starts and I can start on my own specimens. 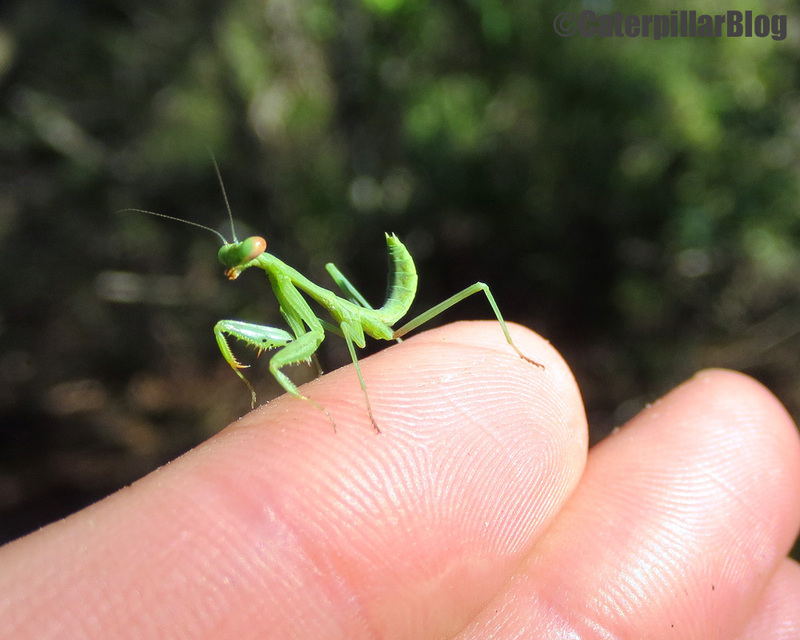 It appears that size is not much of a factor – I saw inflated caterpillars of all sizes (the smallest was about 1cm long). A picture with my hand hovering just above the glass, to give a sense of scale. 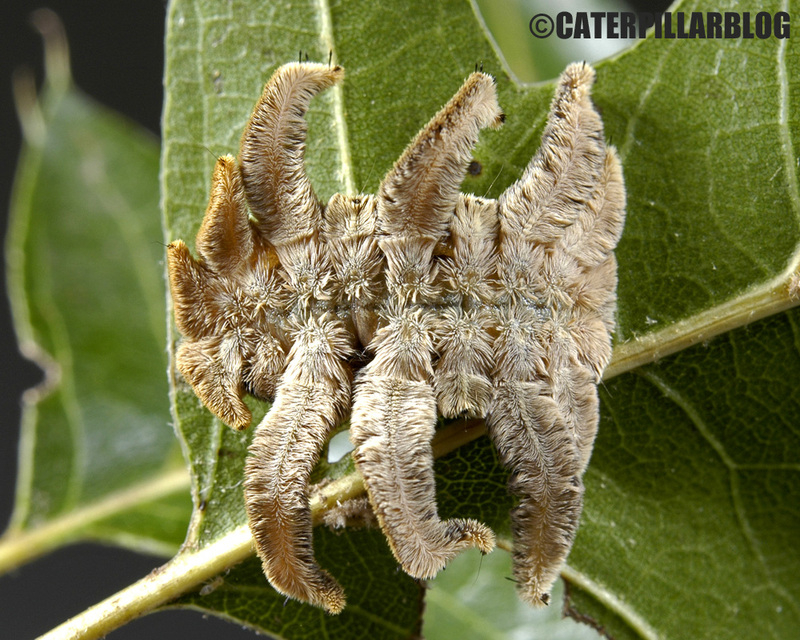 I wonder what the guts of those caterpillars looked like when they were squished out? 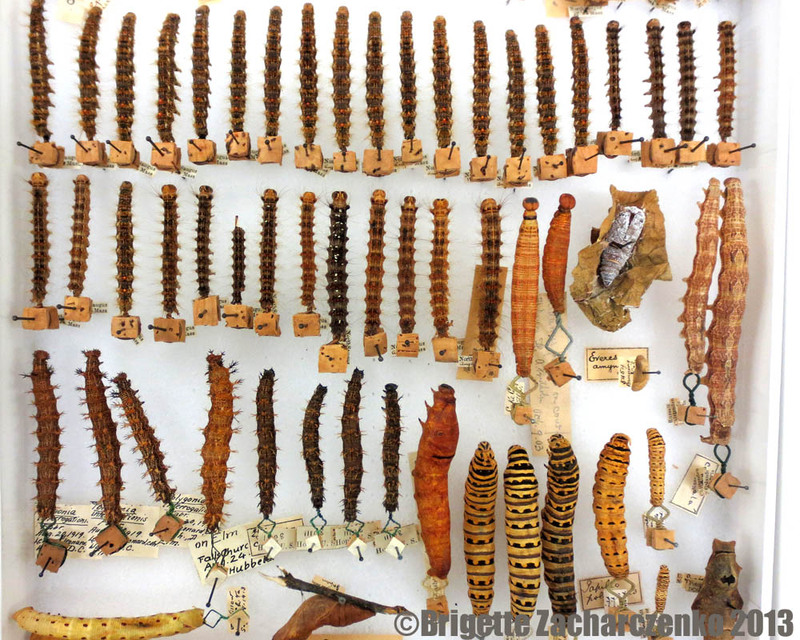 While some inflated caterpillars are curated within the main collection, and some of them are grouped by family in the larval cabinets, there are many “miscellaneous” drawers with arrangements like this. 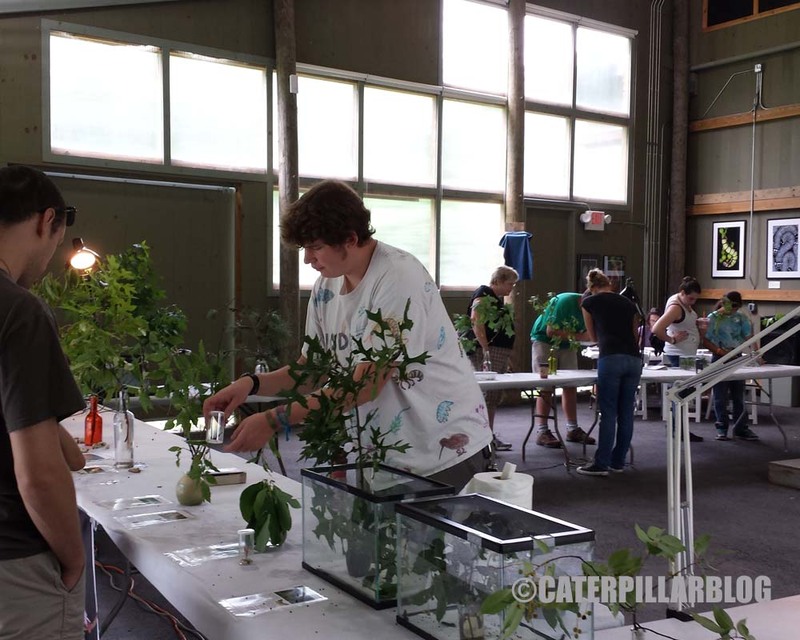 All sorts of caterpillars! 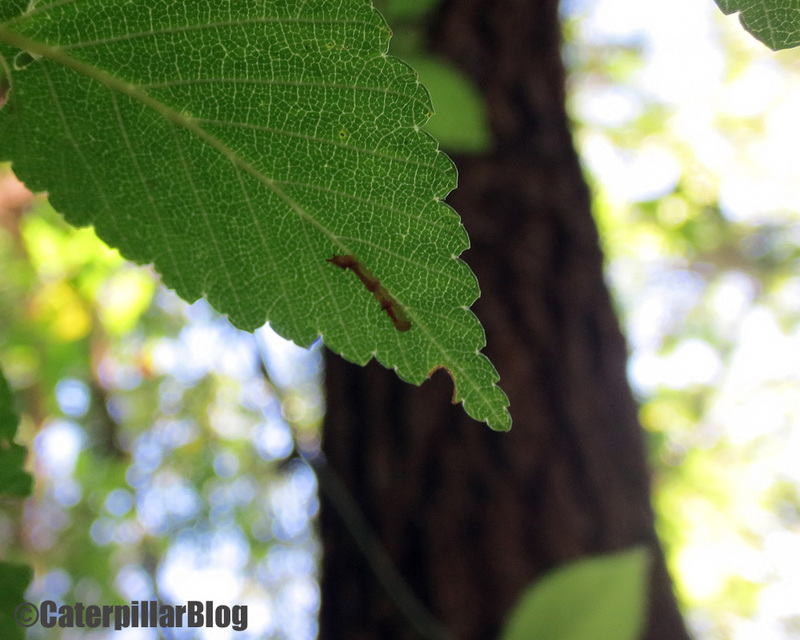 The nice green color of the swallowtail caterpillars (bottom right-ish) was not preserved though. This seems to be one limitation of caterpillar inflation – patterns remain, but colors become lost or distorted. 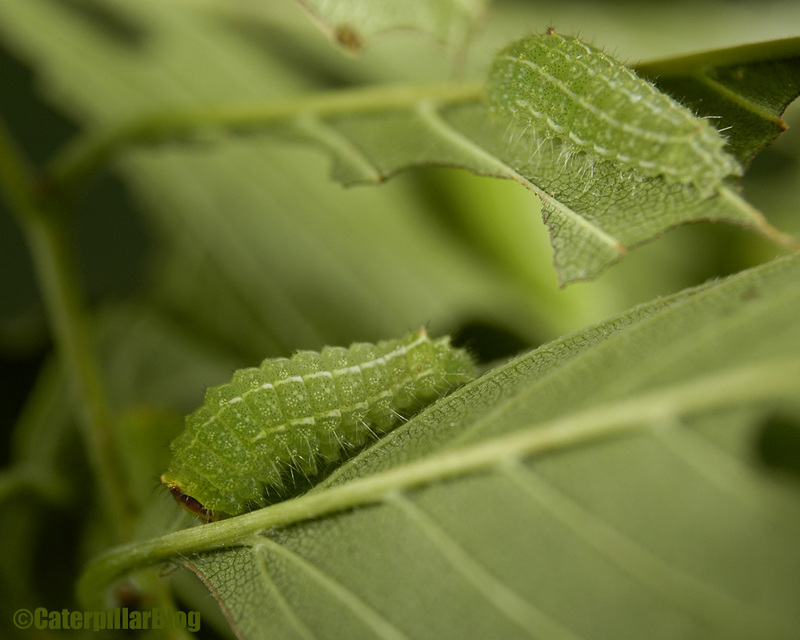 Most inflated caterpillars are some shade of tan/brown. This could be due to the heating process or simply by fading over time due to light exposure. I love how the spines and body shapes are preserved in this one! Many trays and drawers feature small drawings and paintings – sometimes in place of a specimen, sometimes as a helpful reference. 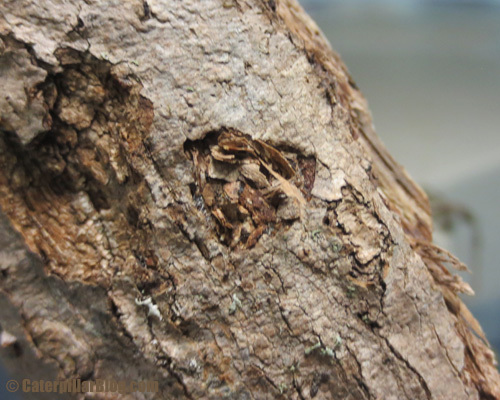 One thing I did not expect to see – everted osmeterium! Swallowtail caterpillars (Papilio) have an eversible gland called the osmeterium which is normally held inside the body. 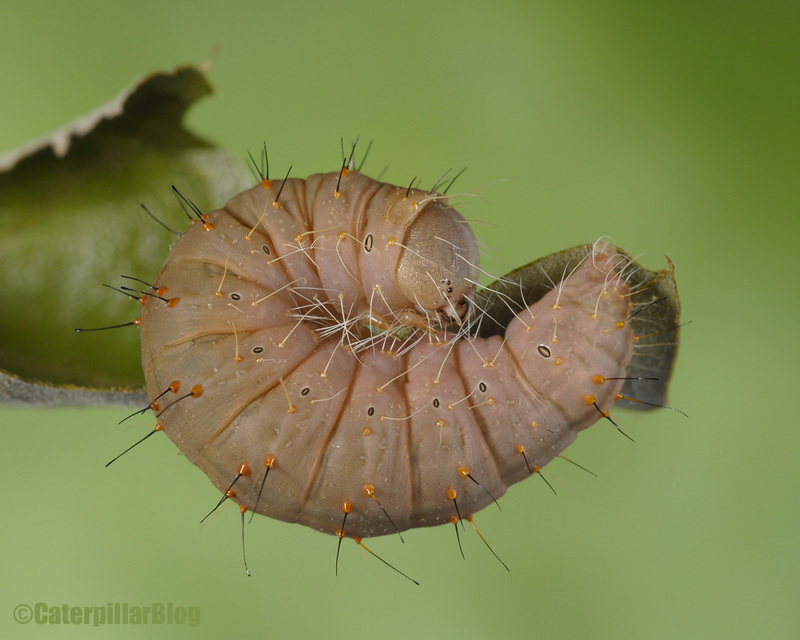 When threatened, the caterpillar sticks out the two forks and tries to touch the attacker – wiping them with smelly defensive chemicals. Just the smell could be enough to deter a would-be predator, but I’m sure the taste is pretty bad too. 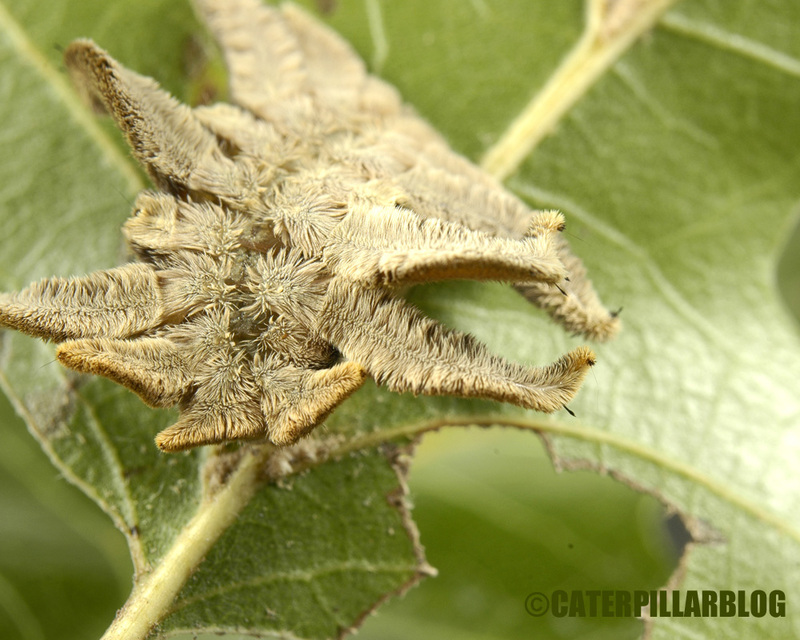 Many of the geometrid caterpillars were preserved in their usual hunched position. I wonder if this was induced somehow during the heating process, or if they simply inflated into the most natural position? Even the spiny limacodids were preserved this way. I was surprised to see one bright green specimen! Perhaps there is hope to preserve coloration after all. 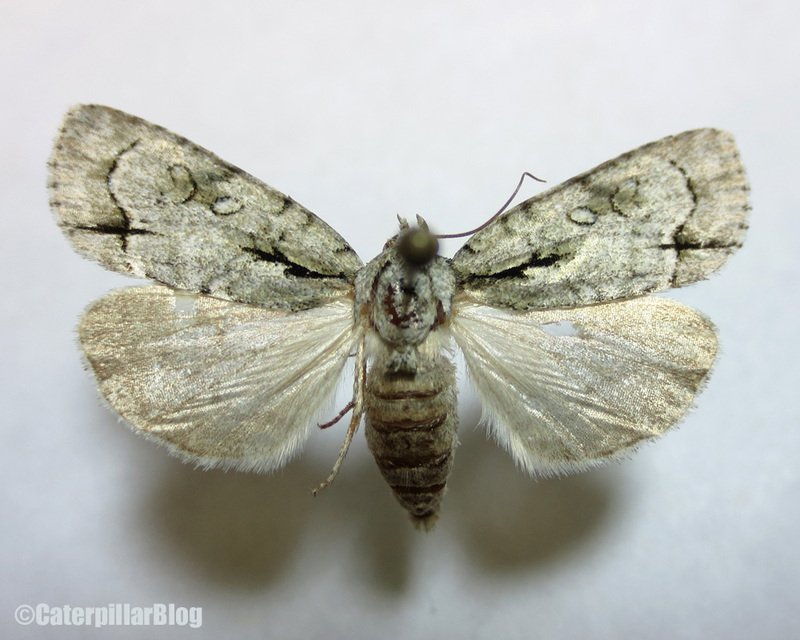 I couldn’t help but include a photo of the megalopygids (fuzzy guys on the right). Preserving them must have been a delicate task, hopefully carried out with gloves – they can give quite a vicious sting! 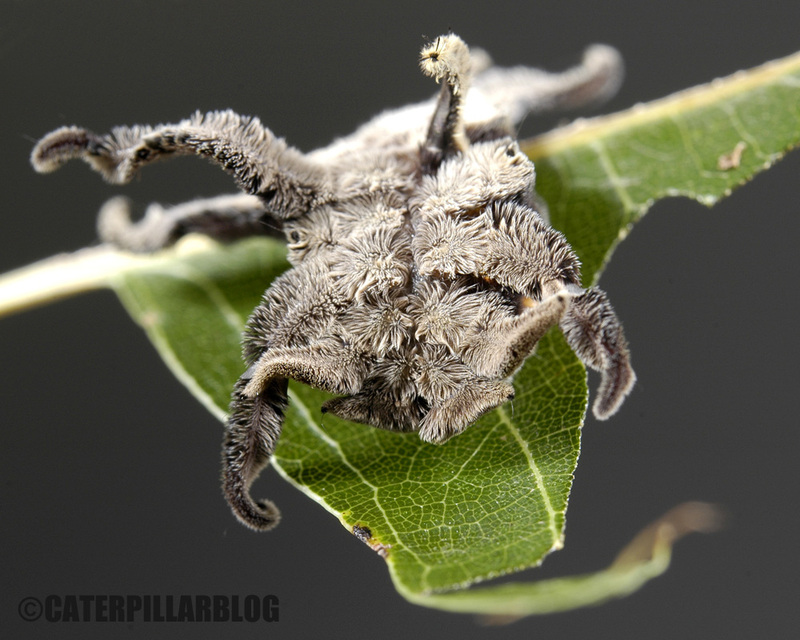 They look more like little mice than insects, and each hair can leave a welt on your skin. 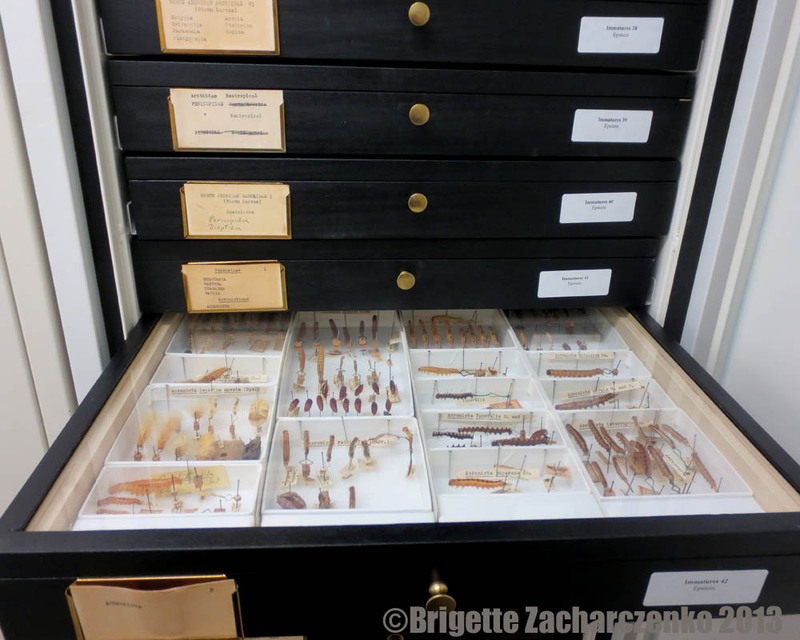 I was tempted to test whether old preserved specimens would still sting, but decided not to try. 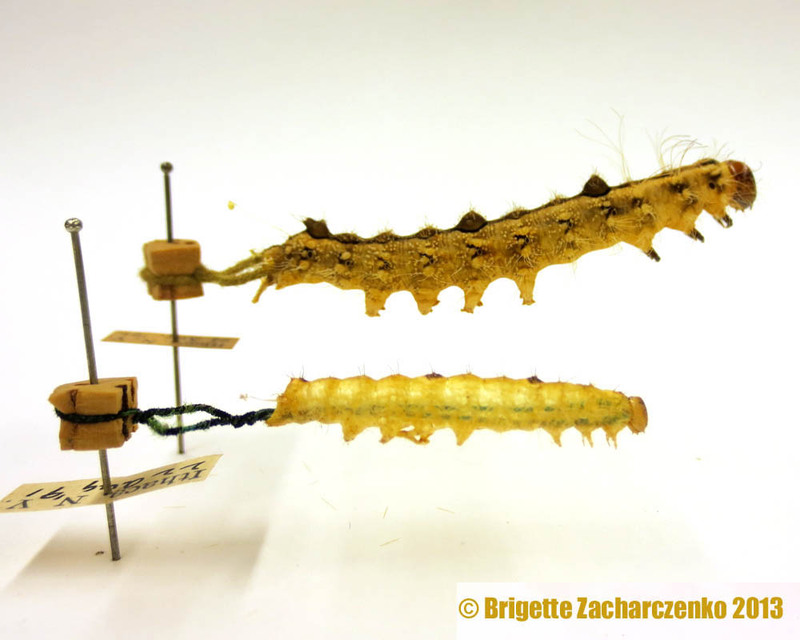 Have any of you ever inflated a caterpillar specimen before? If yes, do you have any advice? 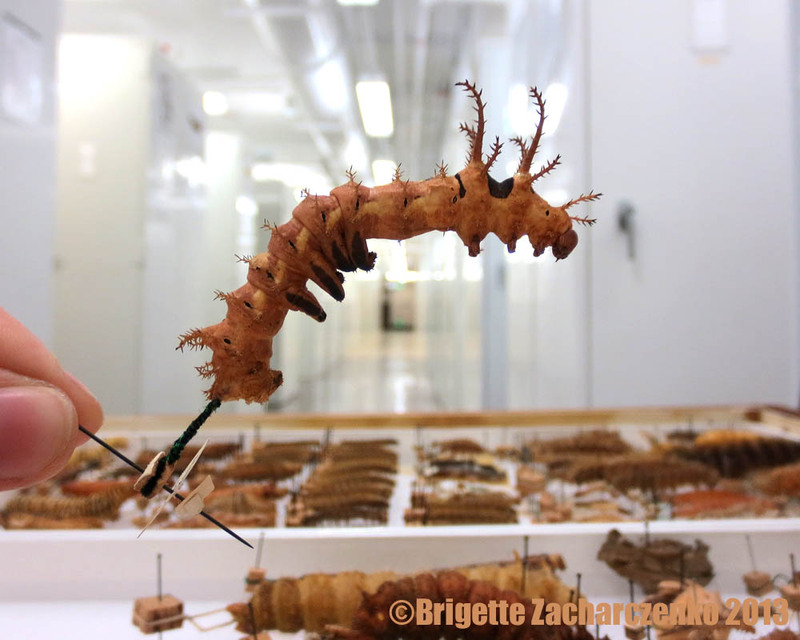 One of the great things about being an entomology graduate student is that going behind the scenes at natural history museums is not only a perk – it is virtually required. 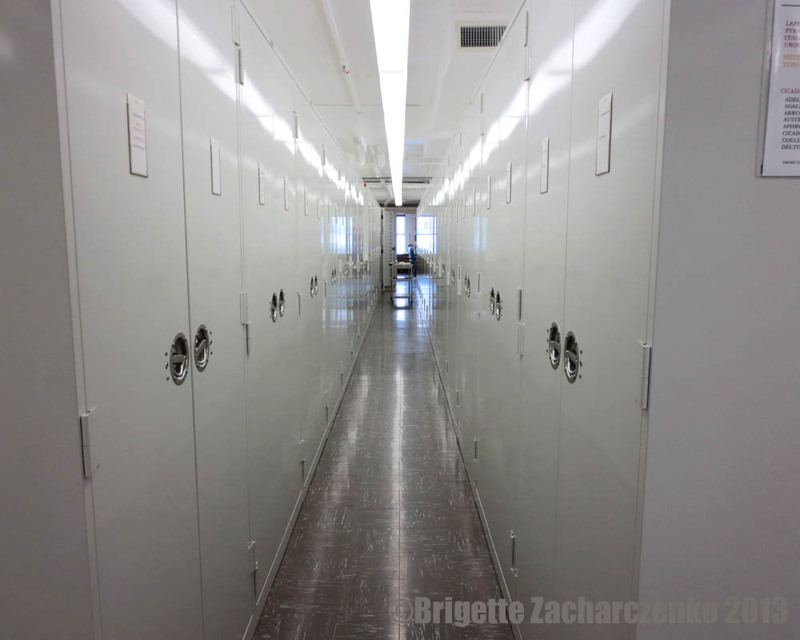 Visiting a museum collection means new professional contacts, new collaborations and inspiration, examining specimens, and sometimes borrowing specimens to study at home. Last week, during “spring break” (grad students might get breaks from classes, but never a real break from work) some members of our lab took a trip to the Smithsonian National Museum of Natural History. We drove from CT to DC, stayed overnight at a cheap hotel, and spent the next two days frolicking amongst the insect cabinets. Well, maybe I was the only one frolicking. Plenty of room to frolic. Carefully. I actually only spent about an hour, on the second day, exploring the public exhibitions. 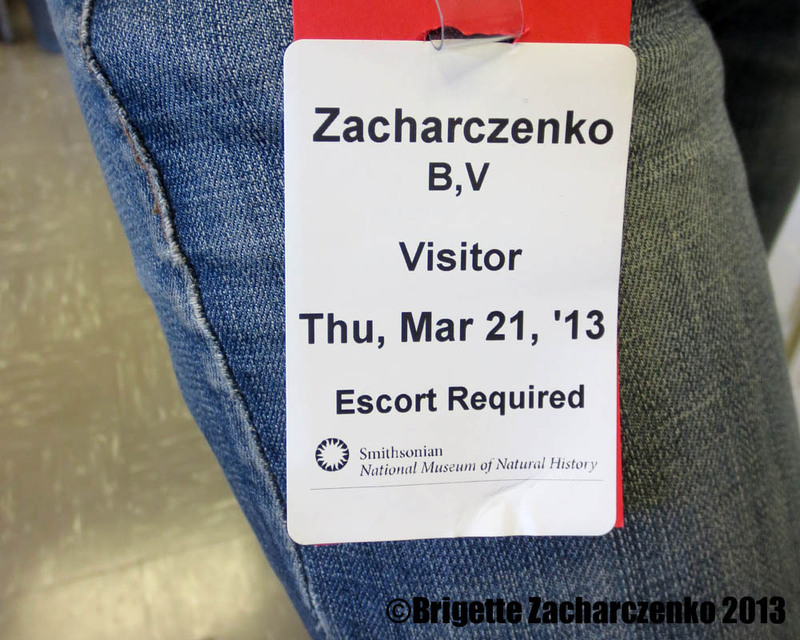 It was much more fun being behind the scenes, especially with the vast amount of specimens available to explore. 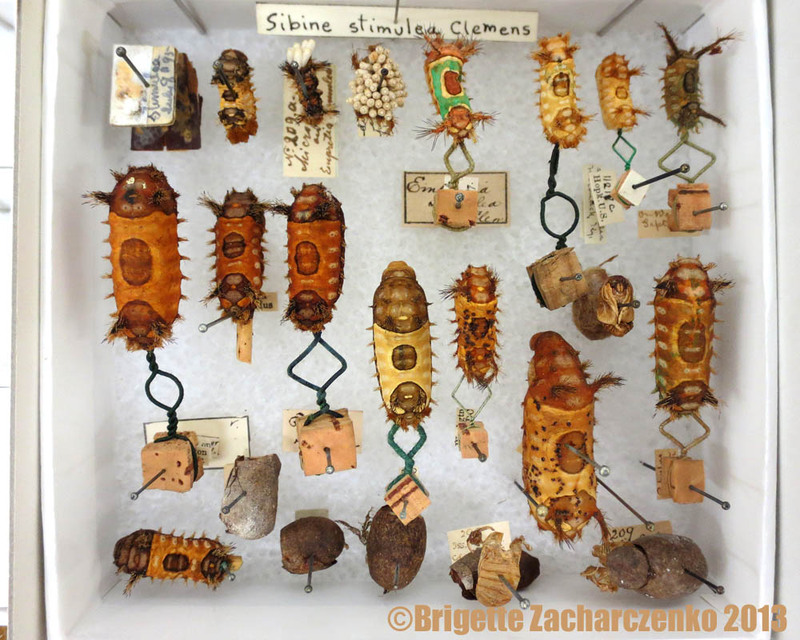 The Smithsonian NMNH holds over 35 million insect specimens in drawers, vials of alcohol, and slides – making it one of the largest insect collections in the world. 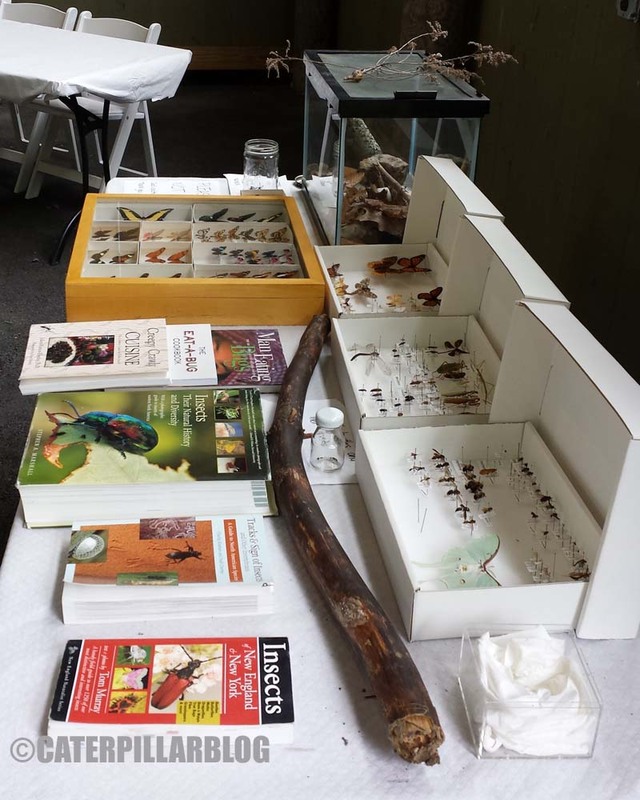 You can read about the History of the United States Entomology Collections here. 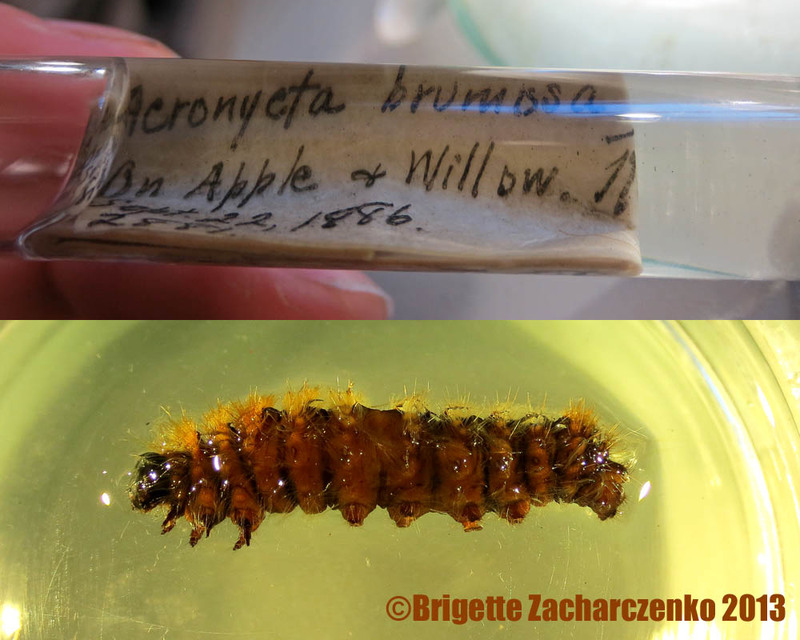 I went to the museum with one major purpose – to see which caterpillars in the genus Acronicta they have preserved in alcohol, and if there are any species I have not yet examined and could borrow for further morphological study. 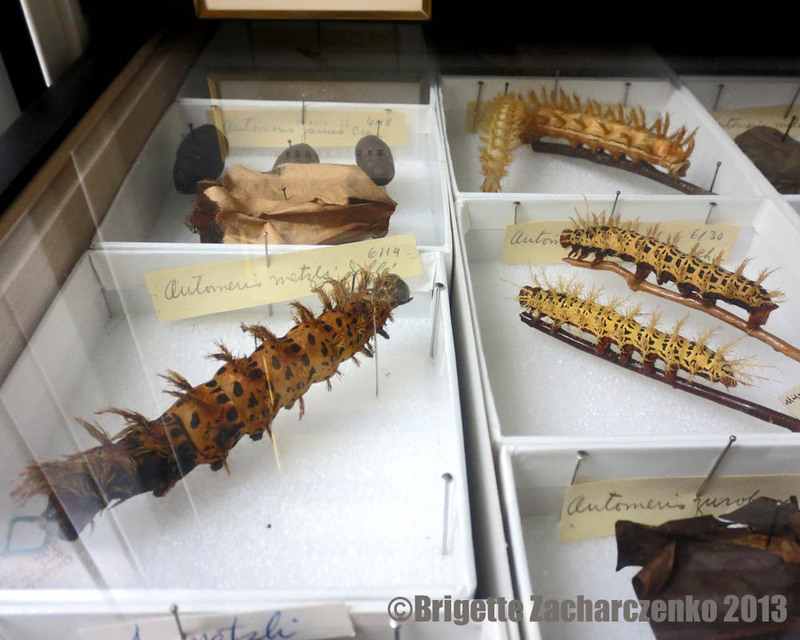 Caterpillars are not often kept in collections (at least not in the same numbers as the more popular adult butterflies and moths) but luckily, the NMNH had what I was looking for. 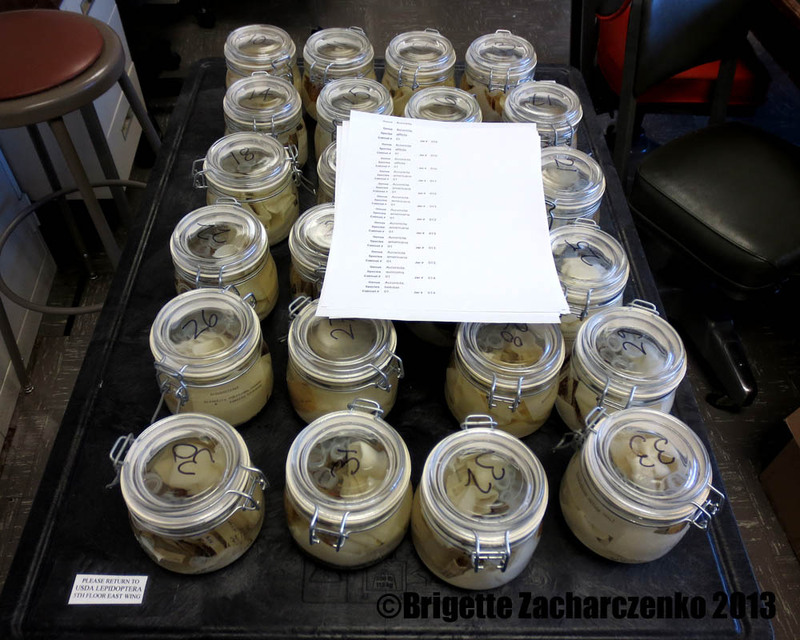 There were 24 jars of ethanol holding Acronicta caterpillars, each jar containing up to a few dozen small vials with preserved specimens. 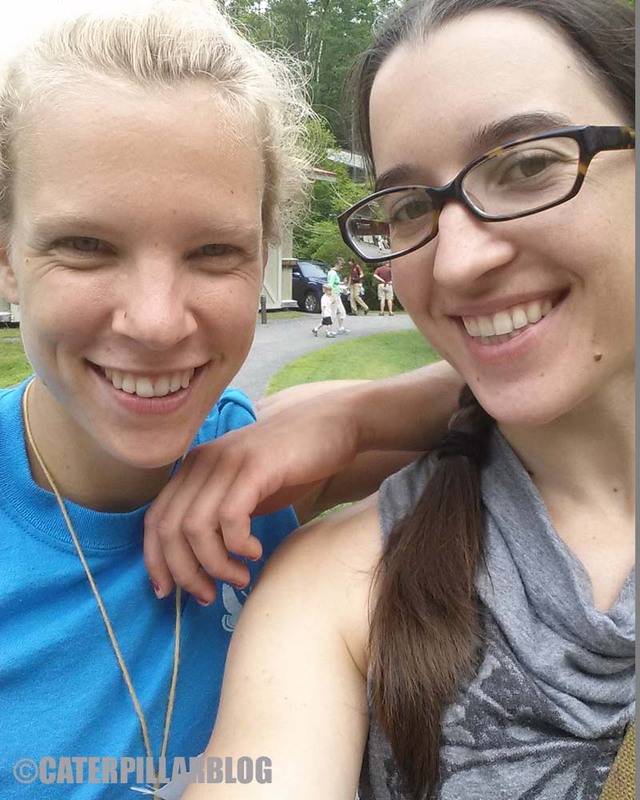 I looked at every single vial, feeling the familiarity of old friends and the excitement of species I had not yet seen. 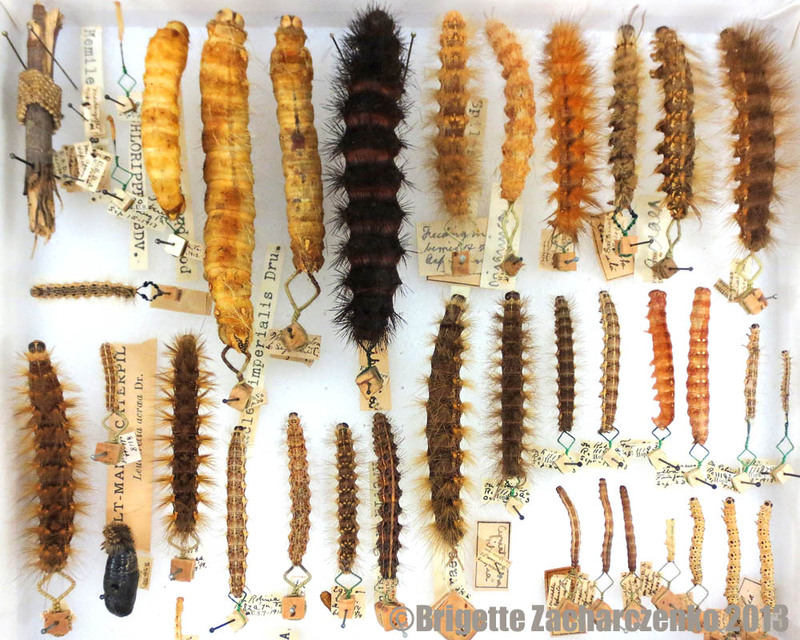 Some specimens were collected by the authors of a seminal work on Acronicta published in 1898, Smith and Dyar. 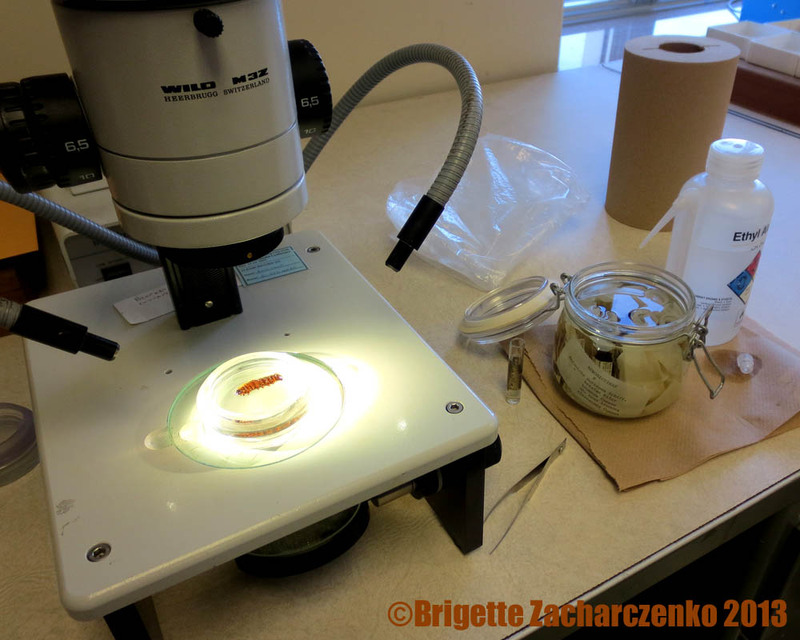 How cool is it to examine specimens collected by your heroes? 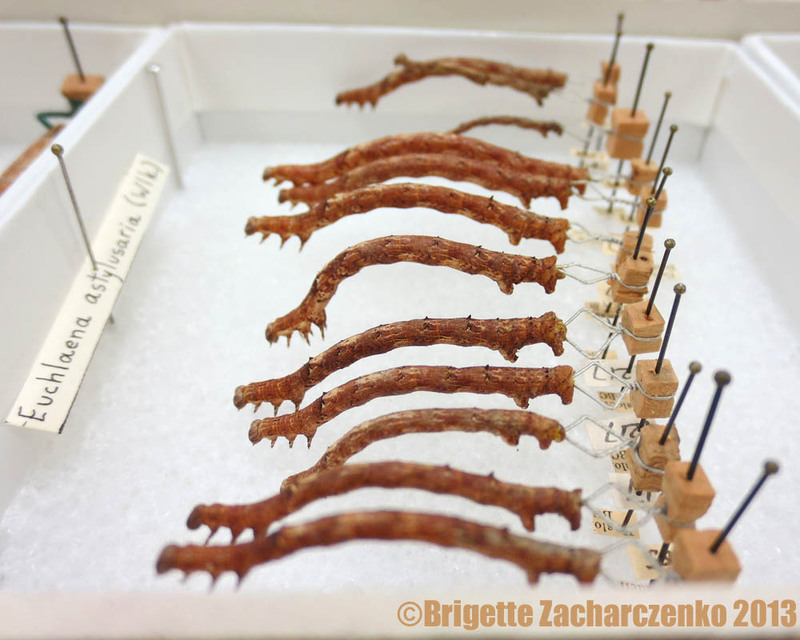 I was amazed by the dates on some specimen labels – the oldest I found was collected in 1886. 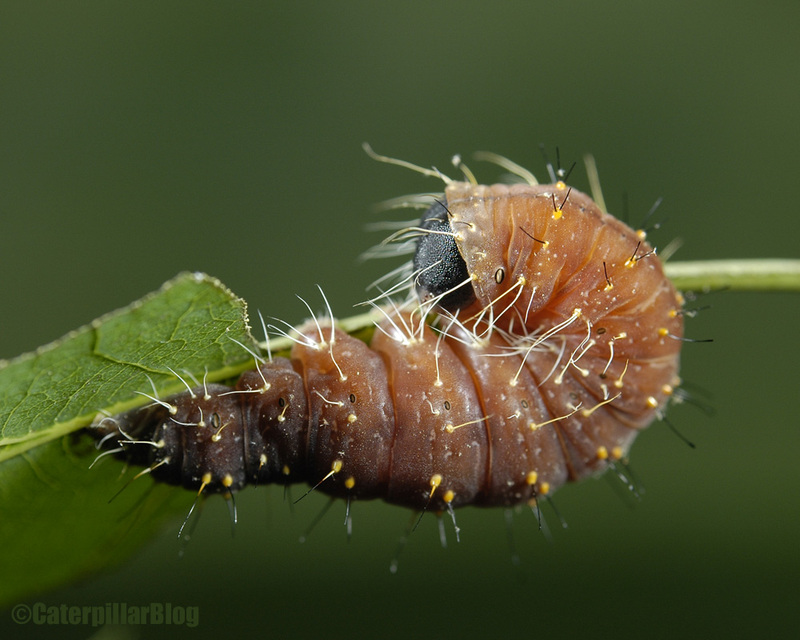 This caterpillar is 127 years old. With a spot to sit and look at specimens, the first day absolutely flew by. The entire evening of dinner and sight-seeing in DC felt like wasted time – I wished I could have stayed at the collection. Maybe if I had curled up to sleep under a desk, no one would have noticed? 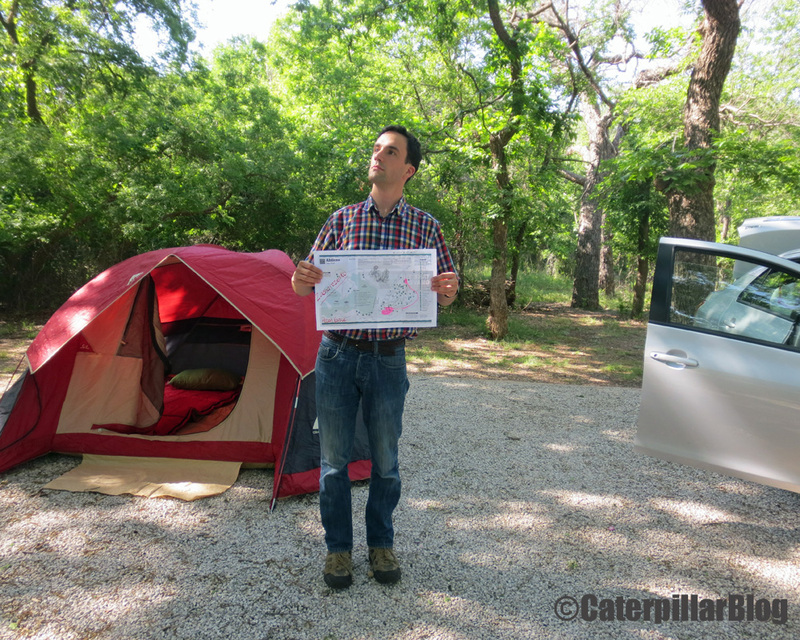 The caterpillars were not just in jars, though. 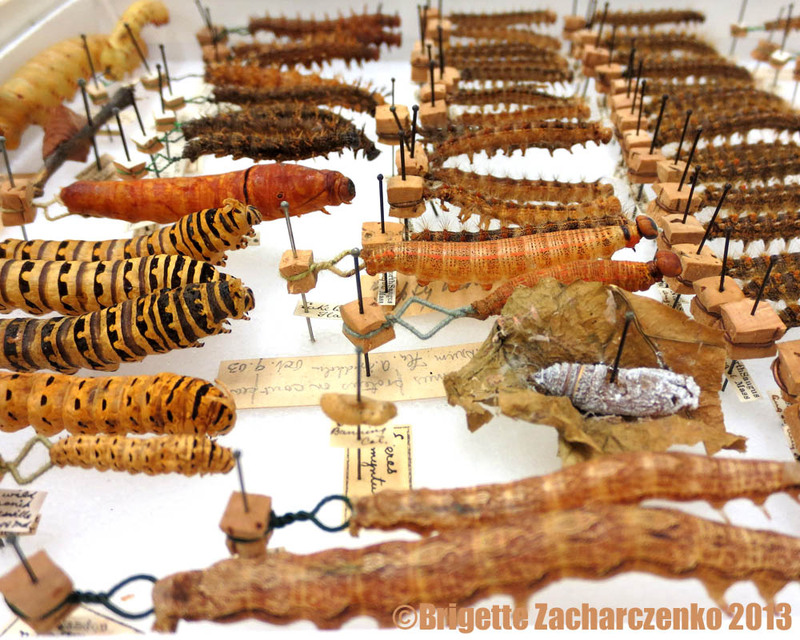 There were also a few drawers of inflated Acronicta larvae from around the world. I took lots of photos, but the memory card from my good camera is currently misbehaving. Hopefully I can recover the photos, though I could always retake the photos on another visit. 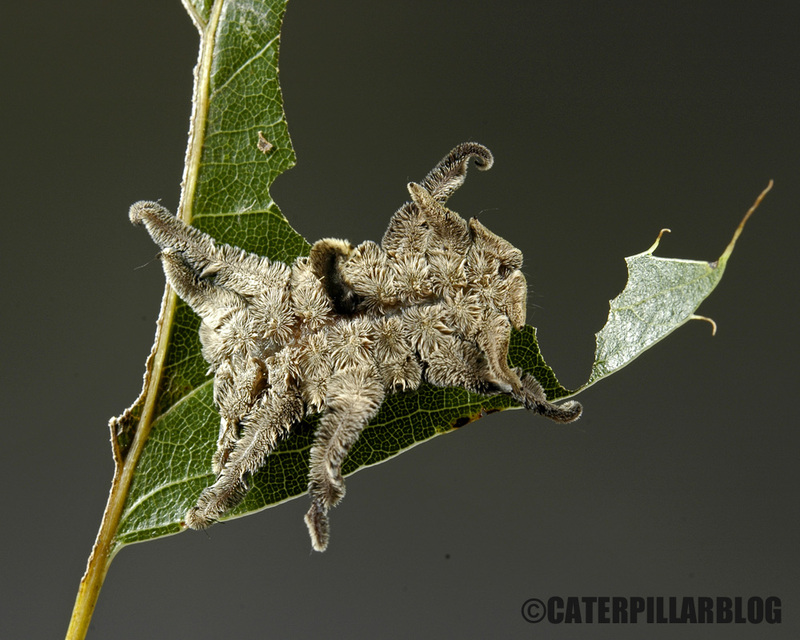 Some of the inflated Acronicta caterpillars. I also met some wonderful people at the museum, and caught up with colleagues I have not seen for months or years. 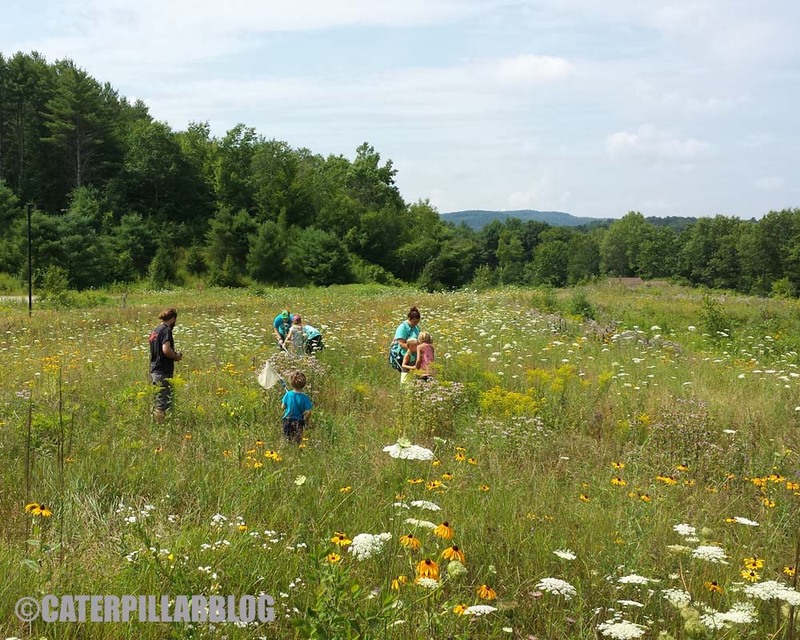 We had some great conversations about field collecting and project ideas. 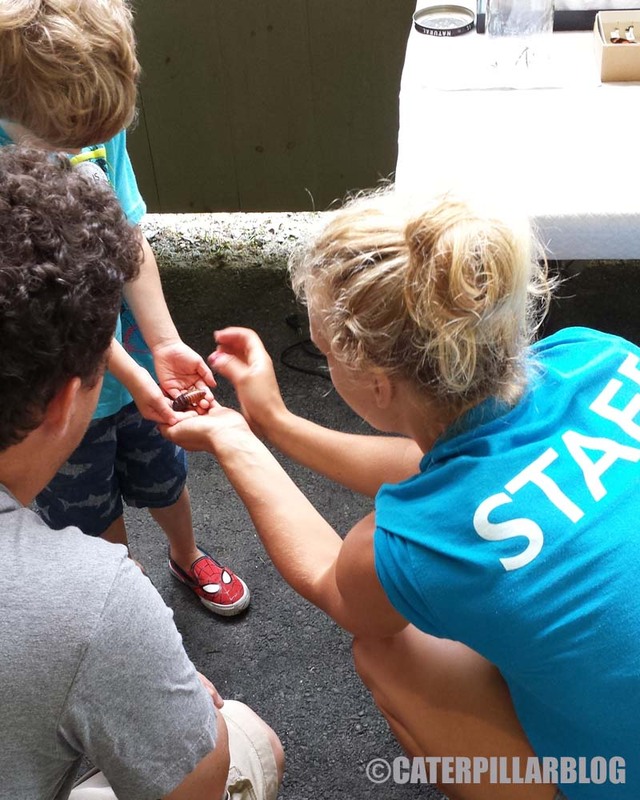 I learned a lot about collecting cave insects while walking through mountains of bat guano – did you know that rabies can be spread through the air? 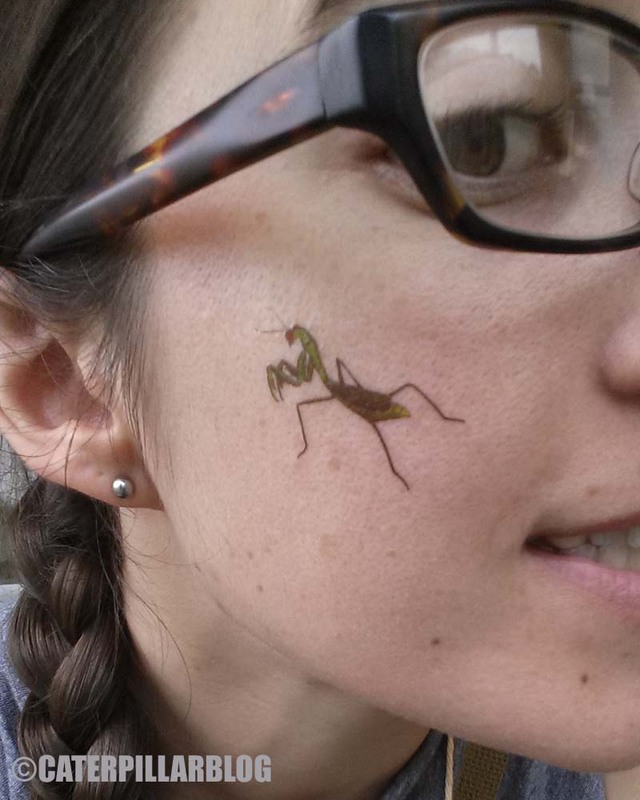 Sometimes entomology can be quite hazardous. 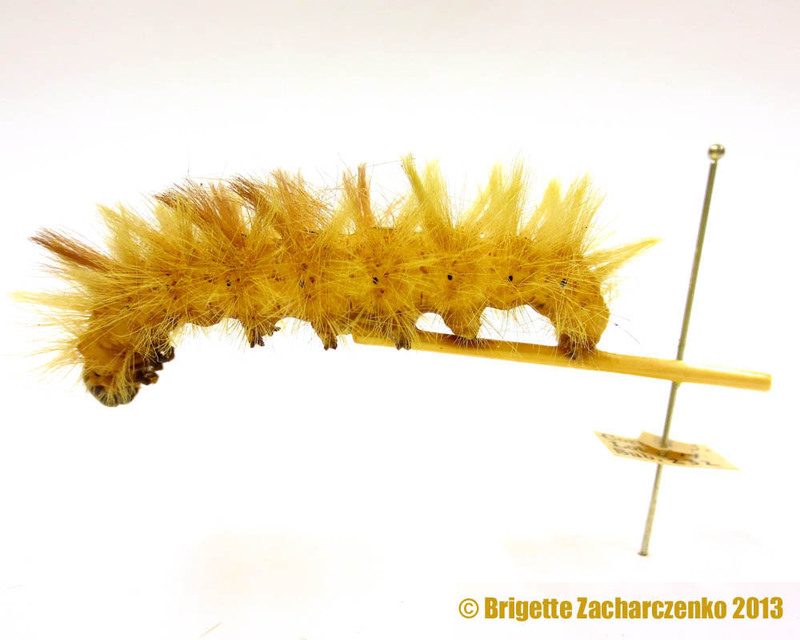 At one point I noticed a toy caterpillar on a shelf in the work room, and gushed over its accuracy and adorable-ness. Later in the day when I returned to my work station, I noticed it sitting on my laptop. My lab members told me I was given a new friend! 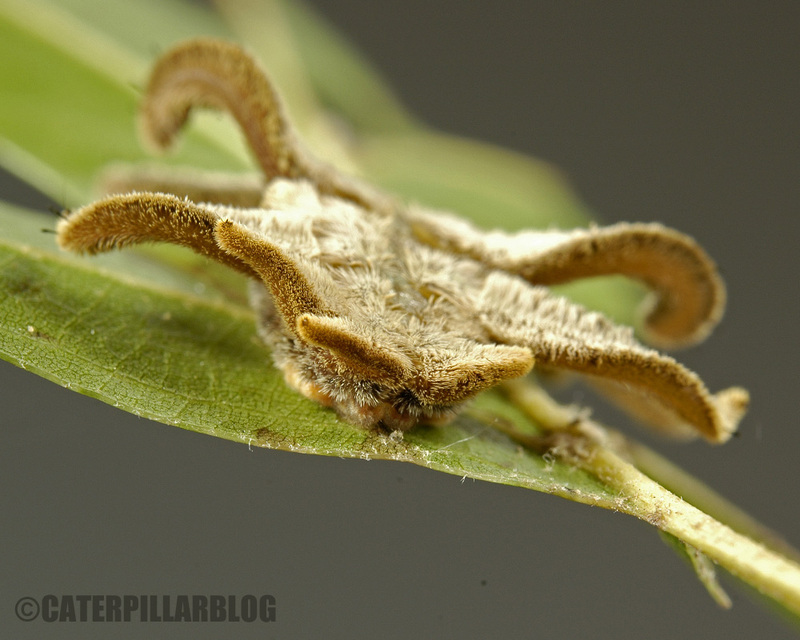 Cerura vinula, the puss-moth caterpillar, family Notodontidae. It now happily lives in my office. The second day was as wonderful and short-lived as the first. 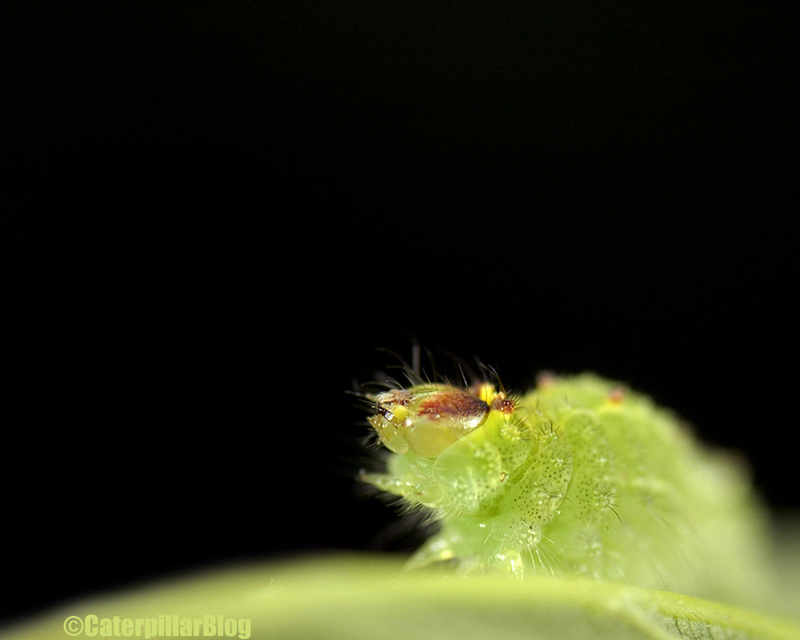 I took many more photos of inflated caterpillars, which I will detail in another post. I felt so honored to be allowed to visit and explore such a historic institution, and hopefully will have many more visits over the course of my career. 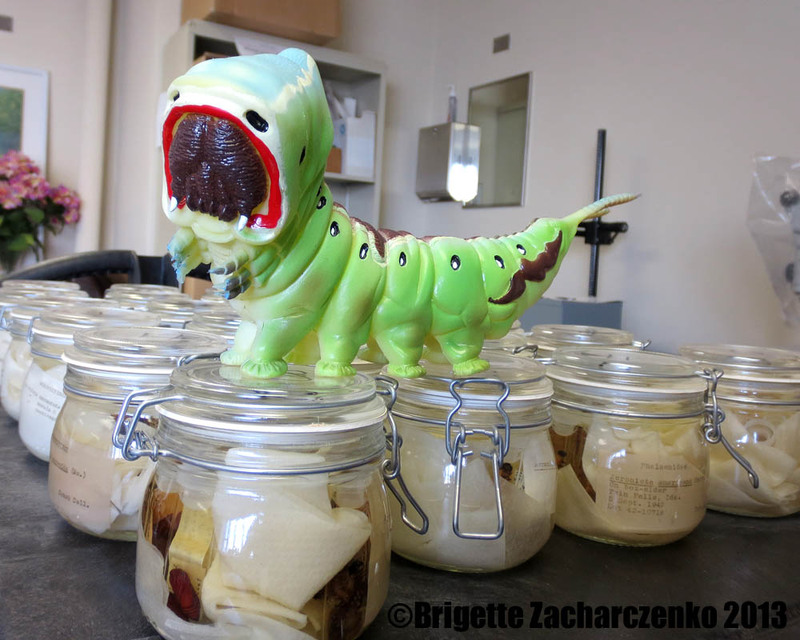 There are several ways to preserve caterpillars for study. You can boil them and drop them into a jar of alcohol, you can freeze dry them, or you can inflate them. 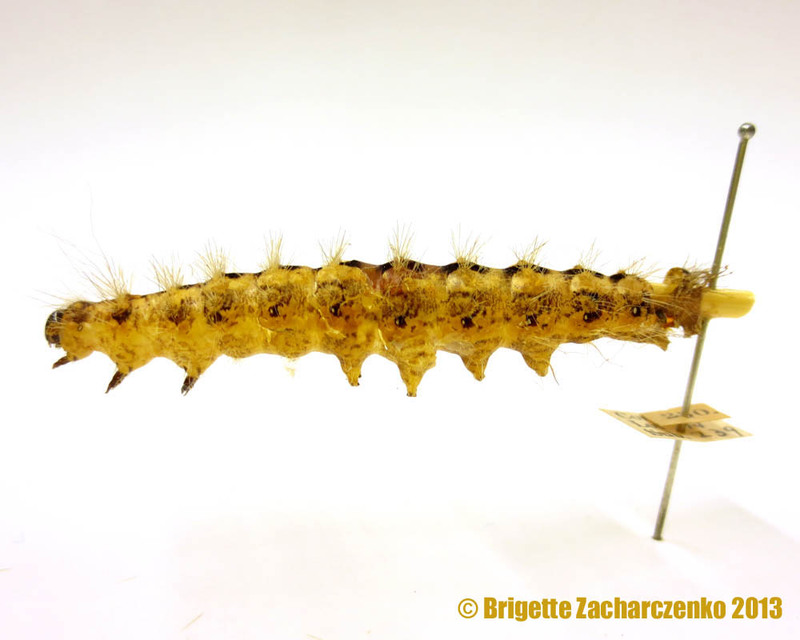 The photos in this post are all of inflated caterpillars, in the genus Acronicta, found at the Cornell University Insect Collection (CUIC). Inflating (or “blowing”) caterpillars is a traditional technique that is no longer taught or commonly used, however it can produce fabulous results. 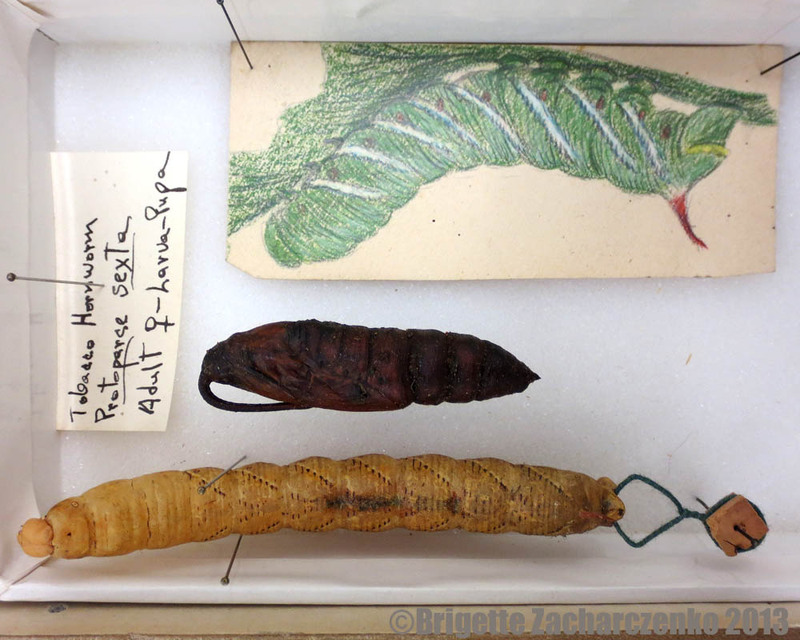 The caterpillar remains dry and can be kept in a drawer along with adults, which makes them easier to study than specimens in alcohol. Their external features are usually well maintained – specimens from the early 1900s don’t look much different from modern specimens. However they are lacking their internal organs, and the last couple of segments are destroyed in the preparation process. The technique is also quite labor intensive and requires unusual equipment. So how does it work? Basically you cut a slit into the posterior end of the caterpillar, and using a pencil, roll out the guts (starting at the head end). You must be careful to not destroy the hairs and other features of the exterior. Then you insert a glass tube and inflate the caterpillar, and keep the caterpillar inflated as you heat it in a small make-shift oven. One colleague described using a coffee can over a bunsen burner for this purpose. 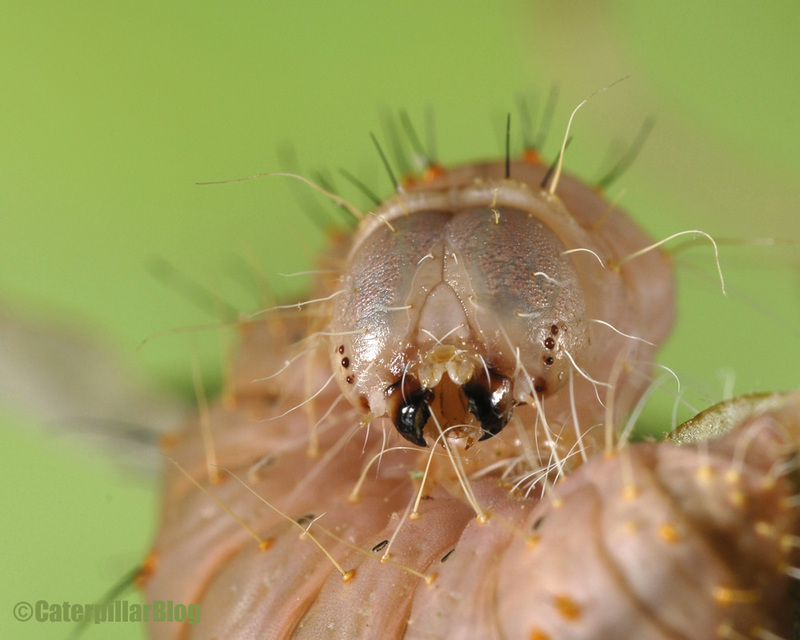 Once the caterpillar is dry, the glass tube is removed and the caterpillar can be prepared for pinning. 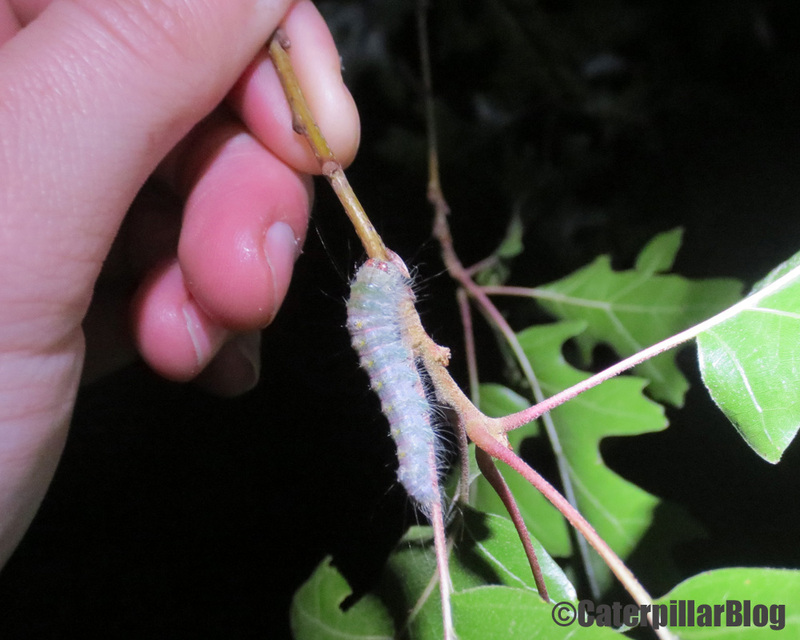 Either a wire or stick can be inserted, or the caterpillar can be glued onto the wire or stick by its prolegs underneath the body. 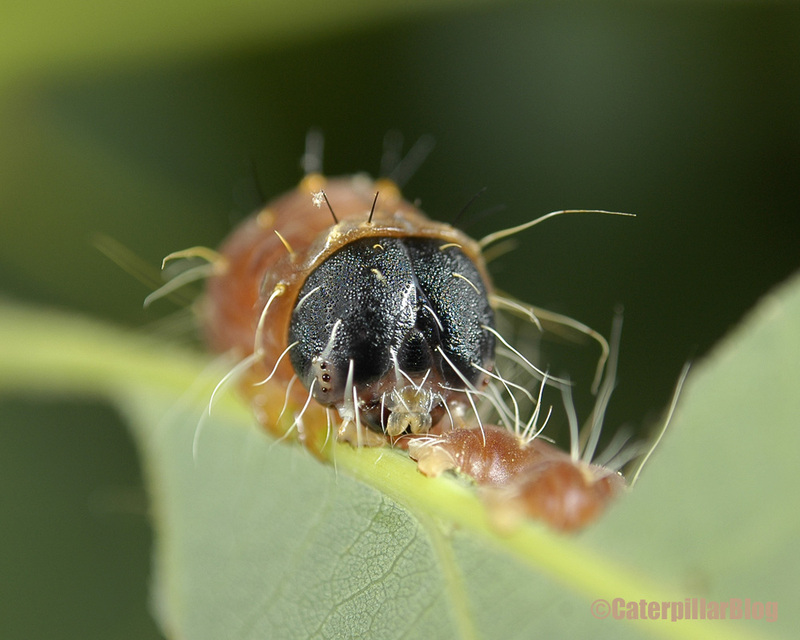 From the photo above you can see that even caterpillars with lots of hairs can undergo this technique. In fact, they look incredibly lifelike. 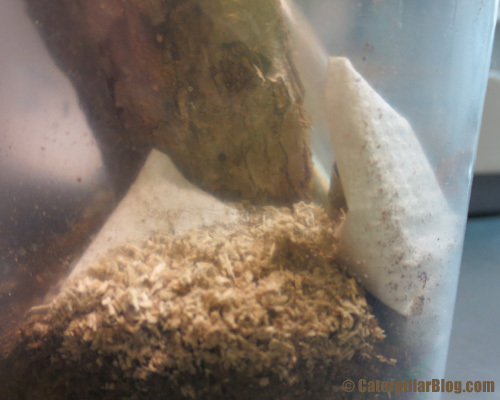 Another benefit of inflating caterpillars is that the body shapes are extended and not distorted by being kept in a liquid. The important bumps and hair positions are kept as their were in life. However the body may be a bit overextended depending on how well it was squished and inflated. 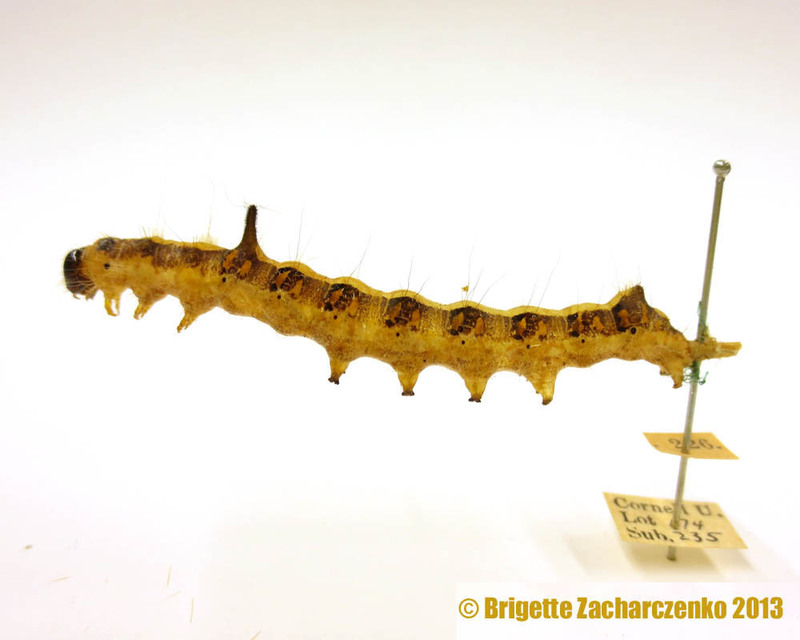 One reason I particularly enjoy the inflated caterpillars is that they are easy to transport and trade – so there are many European species in collections here in the USA. 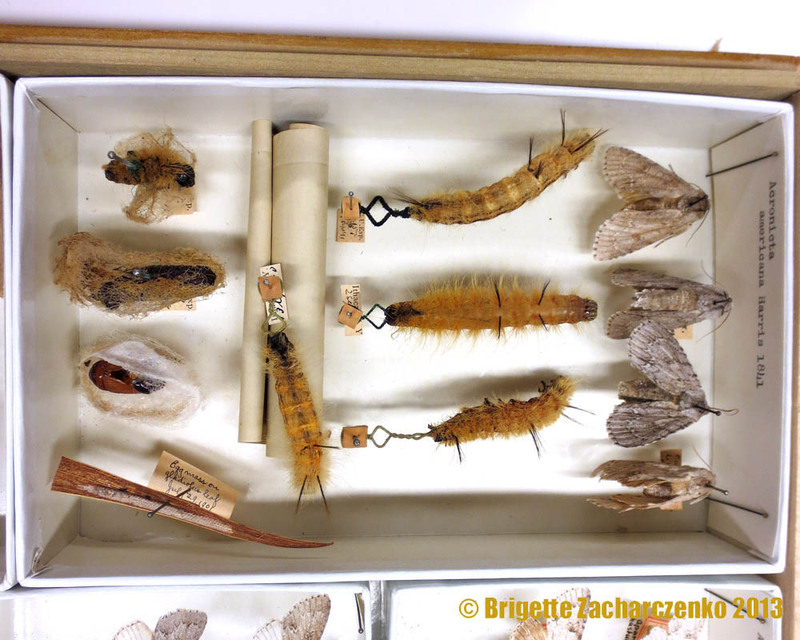 Caterpillars are not often kept in collections to begin with, so to have these specimens available to me for study is quite exciting. As you can probably guess, I’m going to set up my very own caterpillar inflating oven as soon as I can! 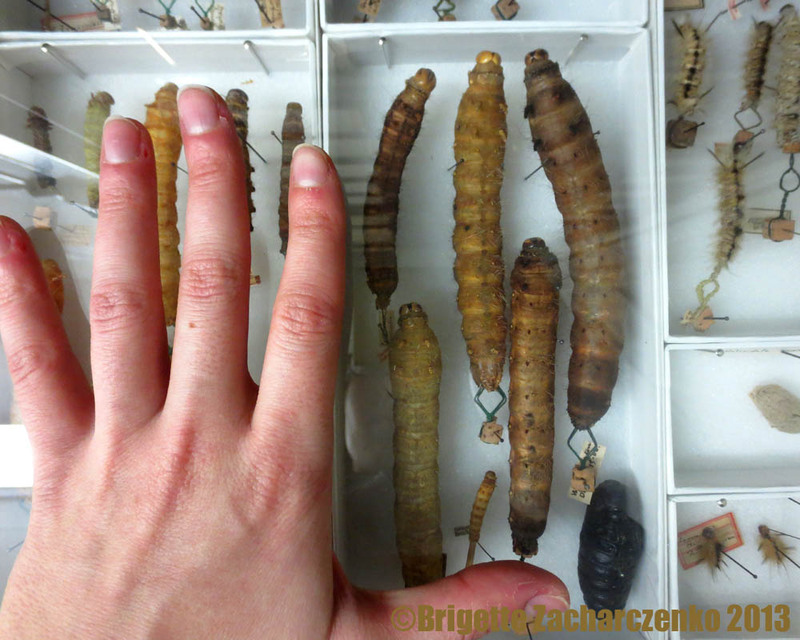 And I’ll have another post soon on even more inflated caterpillars I have found at other collections. University of Minnesota, 1908. 16th Annual Report of the Agricultural Experiment Station. Bulletin #105. 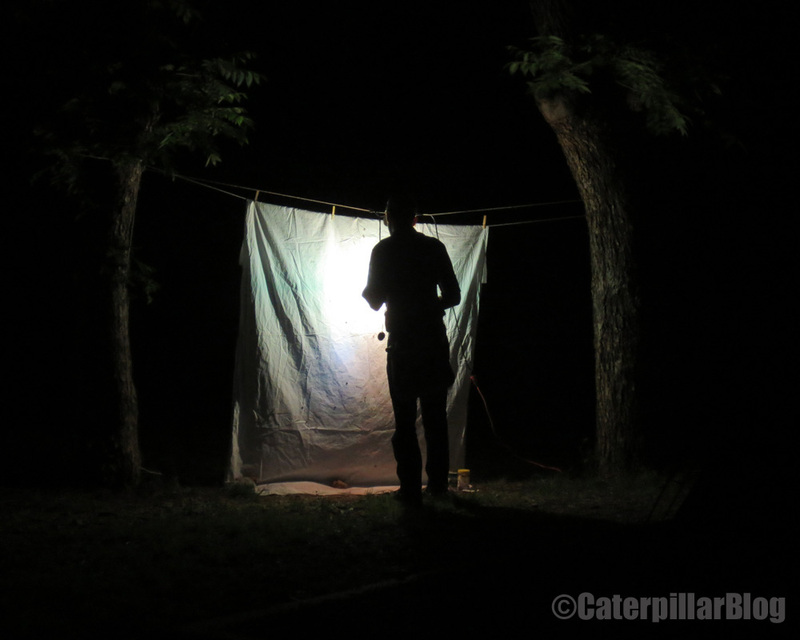 How to Collect and Preserve Insects. Pages 119-146.